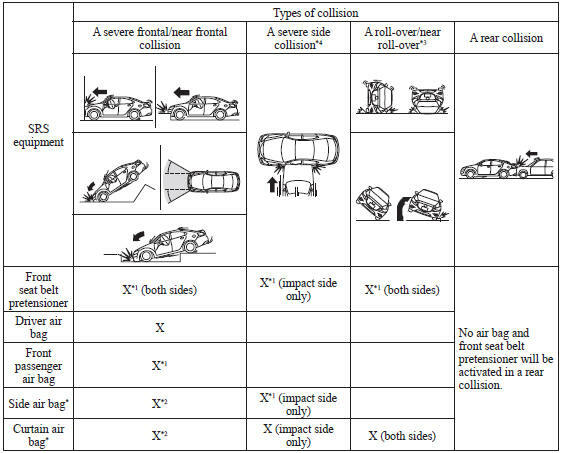 This chart indicates the applicable SRS equipment that will deploy depending on the type of collision. X: The SRS air bag equipment is designed to deploy in a collision. *1 (With Front Passenger Occupant Classification System) The front passenger front and side air bags and the seat belt pretensioner are designed to deploy depending on the condition of the total seated weight on the front passenger seat. *2 (With Front Passenger Occupant Classification System) In an angled collision, the side air bag and curtain air bag may deploy. *3 (With Front Passenger Occupant Classification System) In a roll-over accident, the seat belt pretensioners and the curtain air bags deploy. *4 (With Side/Curtain Air Bags) In a side collision, the seat belt pretensioners and the side/curtain air bags deploy (only on the side in which the collision occurs).